Tim Brasher was still at school studying for his HSC when called into Balmain’s first-grade team by coach Warren Ryan in 1989. That year, the former Australian Schoolboy rep was a centre in Balmain’s grand final loss to Canberra in extra-time but 1992 can be considered Brasher’s break-through year. Although playing much of the year on the wing, Brasher was the equal top try-scorer in the premiership with 16 tries and his great second half performance in the third and deciding State of Origin match saw him chosen in Australia’s World Cup squad. Grabbing the vacant fullback position, he showed composure under extreme pressure in Australia’s tight, 10-6 win over Great Britain in the final at Wembley. Despite Balmain’s indifferent form, Brasher again represented NSW in 1993-94 but the emergence of Canberra’s Brett Mullins relegated him to the bench for his Test debut against France in 1994. Selected with the Kangaroos at year’s end, Brasher had a steady tour and was a reserve back (In all 3 tests, but wasn’t used in the first 2) in the Third Test against Great Britain and the one-off Test in France. One of the first players signed by the ARL during the Super League war, Brasher made three Test appearances against NZ in 1995 before being chosen in Australia’s victorious World Cup team. Brasher was a try-scorer in Australia’s 16-8 win in the final and his form was consistent enough to retain his place in the Australian team against second rate Fiji, Papua New Guinea and Rest of the World teams in 1996-97. Outspoken and outwardly abrasive, he baulked at a new contract with Balmain at the height of uncertainty about the reunification of the game in 1998. Left without a club after Balmain closed the door on negotiations, Brasher signed with Souths after talks with Super League club Canterbury stalled. (Balmain actually halved their offer when he was 4 minutes late in giving them an answer). He then signed with Canterbury, and was subsequently approached by Souths. His good form in a struggling Rabbitohs team saw him selected for NSW before recapturing a Test spot on the wing for the final two Tests against NZ at the end of the year. Following Souths’ exclusion from the NRL premiership in 2000, Brasher signed with North Queensland. 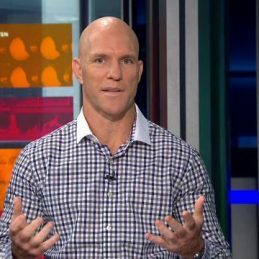 His early good form saw him retain his place in the NSW State of Origin team but an off-season injury at the end of the year ruled him out of the entire 2001 season. Early in 2002 he was forced to retire but later began a career as a club owner in Canada and as a caddie for Terry Price, Tim Wilkinson and Craig Parry on the lucrative European and US PGA Tour’s. His behind the scenes stories and anecdotes of his playing career and as a caddie on the PGA tour make him an in demand after dinner speaker and corporate golf partner.